CARACAS, Venezuela (AP) — Three Venezuelan diplomats were ordered out of the United States on Tuesday in response to their government's decision to boot three U.S. officials from Venezuela, including the highest-ranking U.S. envoy in the country. 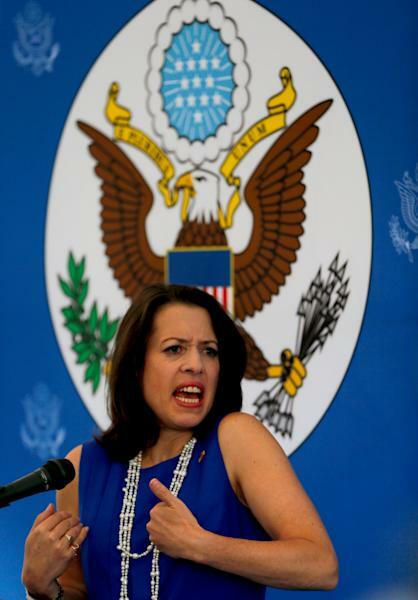 Venezuelan President Nicolas Maduro announced the expulsion of U.S. charge d'affaires Kelly Keiderling and two other diplomats Monday, accusing them of conspiring with "the extreme right" to sabotage the South American country's economy and power grid. U.S. officials vigorously denied the allegation and had hinted Tuesday afternoon there might be a retaliatory expulsion of Venezuelan envoys. 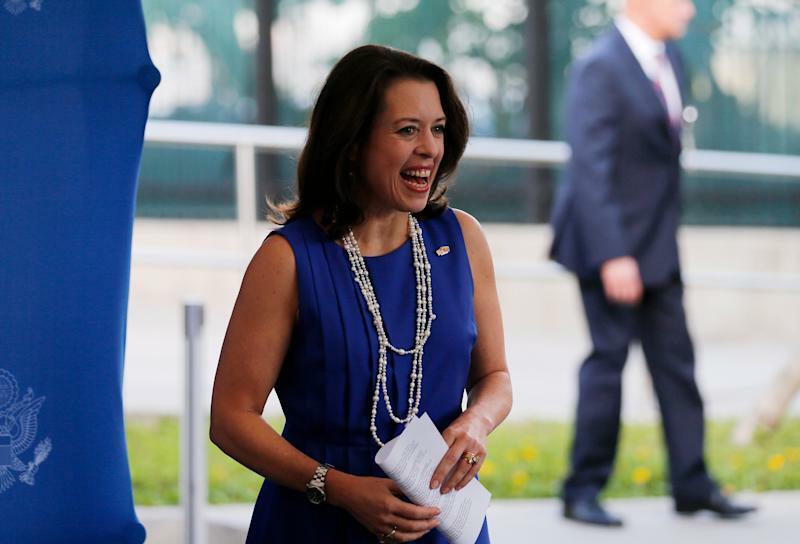 Late Tuesday, the State Department said it was expelling Venezuelan charge d'affaires Calixto Ortega Rios and Second Secretary Monica Alejandra Sanchez Morales at the Washington embassy and Consul Marisol Gutierrez de Almeida at the Houston consulate. It gave them 48 hours to leave the U.S., the same time frame set by Venezuela for the U.S. envoys. "It is regrettable that the Venezuelan government has again decided to expel U.S. diplomatic officials based on groundless allegations, which require reciprocal action. It is counterproductive to the interests of both our countries," the State Department said. Maduro said earlier Tuesday that socialist-led Venezuela will not have cordial relations with the United States as long as U.S. diplomats continue what he alleges are attempts to destabilize his country. Speaking from the government palace, Maduro said that "while the government of the United States does not understand that it has to respect our country's sovereignty there will be simply be no cordial relations nor cordial communication." "The day that the government of President (Barack) Obama rectifies the situation we will establish new points of contact to discuss common issues," said Maduro, the hand-picked successor to late President Hugo Chavez. State Department spokeswoman Jen Psaki said the allegations were related to the U.S. Embassy workers' travel to Bolivar state, which is home to troubled state-owned foundries and Venezuela's main hydroelectric plant. "They were there conducting normal diplomatic engagement, as we've said in the past and should come as no surprise," Psaki said. In a news conference in Caracas, Keiderling said she and the other diplomats would leave Venezuela on Wednesday before the 48-hour deadline expired. "The work of the embassy will continue. It doesn't matter very much if it is one person or another" doing it, she said. She said that if the accusation against them was that they had met with Venezuelans then "it is true. We met with Venezuelans." "These meetings with civil society can be with (the independent election monitoring group) Sumate, they can be with a group of women, with mothers who have lost children or with an environmental group that wants to lobby for cleaning a park," she said. "If we aren't talking with these people, we aren't doing our jobs." 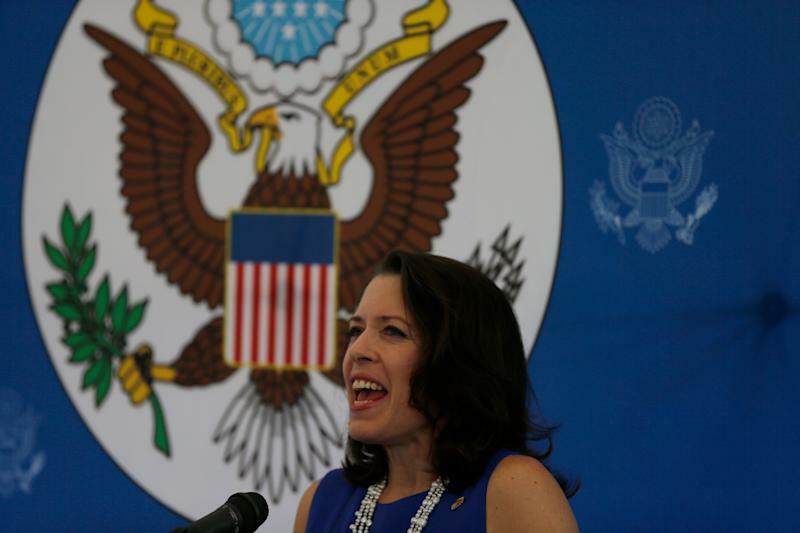 Expelled with Keiderling, the top embassy official in the absence of an ambassador, were consular officer David Moo and Elizabeth Hoffman, who works in the embassy's political section. On Monday, Venezuelan state TV showed photographs and video of the three U.S. diplomats in Bolivar and the neighboring state of Amazonas, including making visits to offices of Sumate, which helped organize a failed 2004 recall vote against Chavez. Foreign Minister Elias Jaua accused them of working with Sumate on "the idea" of not recognizing the results of Dec. 8 elections for mayors and city councils. Dashiell Lopez, a board member of Sumate, denied that members of the group had met with the expelled diplomats. He said in a phone interview Tuesday that Sumate only lent its facilities for a meeting last week between the diplomats and religious groups. "There was no meeting with Sumate, and no people of Sumate were at the meeting," he said. Maduro has said a group of embassy officials that his government had been following for months was "dedicated to meeting with the Venezuelan extreme right, to financing it and feeding its actions to sabotage the electrical system and the Venezuela economy." Venezuela's economy is increasingly struggling ahead of the Dec. 8 elections. Annual inflation is at more than 45 percent and the government is running short of foreign currency. The oil-rich OPEC member country has been plagued by worsening power outages since 2010. The opposition blames neglect and poor maintenance, while alleging mismanagement and corruption at struggling state-owned aluminum, iron and bauxite foundries in Bolivar. Maduro has blamed sabotage by the "extreme right" for both the blackouts and for food shortages, but he has provided no evidence. Like Chavez, he has a history of making unsubstantiated accusations against the United States and his political opponents.